[Journal] New Collection of Big Bang in June 2014!! Oh Yeah!!! I'm totally HAPPY!!! 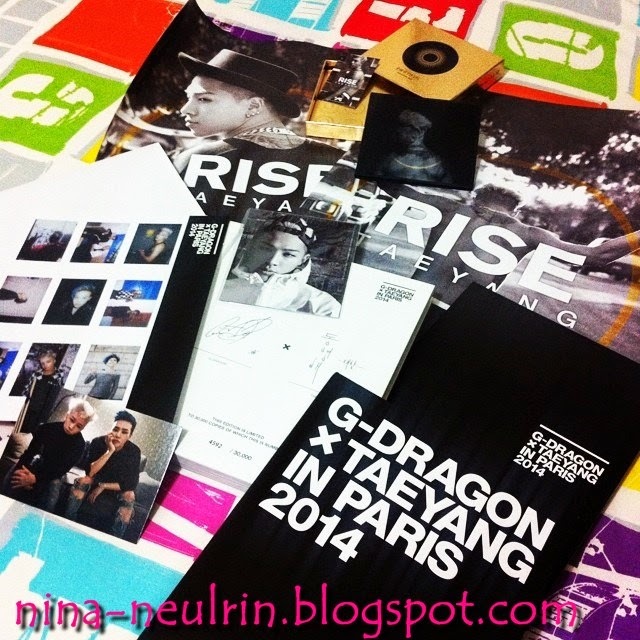 I got limited edition of Taeyang 2nd Abum Rise Deluxe version and Photo-book DVD G-Dragon x Taeyang in Paris 2014!!! Now, all this collection of Big Bang at my room!!! First thing when I open this collection that I was bought is I'm screaming!!! I not expected I got this... Even the shipping cost from Korea to Malaysia was expensive but I never regret to bought this things in my life.. I LOVE IT!! Actually, I was plan want to buy Taeyang 2nd Album Rise Deluxe version as known as limited edition of Taeyang 2nd Album Rise - but it's hard to get this album especially on YGEshop website. Worldwide VIP want to buy this album since it's limited edition. I not put big hope to buy this album since I know it hard to get it. Suddenly, my friend told me that our lucky this time she already make pre-order of Taeyang 2nd Album Rise Deluxe version on YGEshop website. That totally, our lucky!! We got it!!! What can I said?!! Taeyang 2nd Album Rise Deluxe version is everything GOLD!! LOVE IT!! Inside this album have photo-book, CD, postcard, and AMAZING cover album.. Totally, AWESOME!!! All pictures of Taeyang was sooooooooooo handsome and cool guy. I also LOVE all songs in this album. I feel so worth, I waiting 4 years for this album come-out and bought it..
Then, Photo-book DVD G-Dragon x Taeyang in Paris 2014!! Truly, I was open my heart about fashion from G-Dragon since G-Dragon got unique taste of fashions. I LOVE his FASHIONS.. What can I said he is FASHIONISTA!!! Everything he wear, it's will look nice and suit to him. I'm proud be VIP and I was learn many new things from them. I always support them FOREVER!!! BIGBANG always TOP in my heart!! YEAH!! !